For for the original arcade game and its ports, see Alien Syndrome. Alien Syndrome is a video game by Totally Games. It is an update to the franchise created by the action Game Alien Syndrome by Sega. It was released for the PlayStation Portable and Wii in 2007. The 2007 iteration takes place two decades later from the previous games and introduces RPG elements to the gameplay. The title is set in the far future, where interplanetary space travel is possible. Communication is lost with one of the stations on a distant planet, and Aileen Harding is sent to investigate. 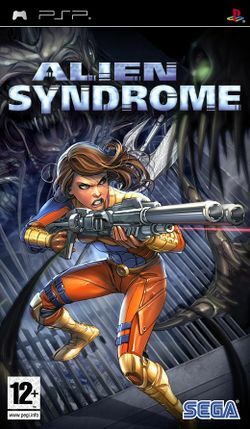 She quickly discovers that 'Alien Syndrome' is behind the disappearance and decides to fight the enemy and find out what happened to her boyfriend, Tom. This page was last edited on 10 July 2016, at 02:30.